"Leszek Nowosielski’s art is born of an enduring fascination with matter, its organic and plastic character, and its possibilities of expression. It is also rooted in an abiding interest in the most appropriate forms of expression at a particular moment. That is why besides expressive figural scenes there appears organic abstractionism, which is then replaced by images inspired by surrealism, or by pictures which return to a nearly impressionistic aesthetic with landscapes filled with light. This is a fascination with the act of creation itself, the joy of creating matter according to one’s own desires, inspirations, and quests. Hanna Modrzewska-Nowosielska’s lifelong interest was theatrical choreography and costumes: arrangements inspired by ballet performances, compositions made up of human silhouettes and showing the tragedy of the Holocaust." "Great artists, charming people – these are the first things that come to my mind when I think about Hanna and Leszek Nowosielski. Later, I can see their house, saturated with art, in a beautiful, mysterious garden. A magical world in which nature imparted brightness to art, and art emphasized the beauty of nature." "Thickly applied paint creates convex streams. In deep ruts between them there is colour and darkness. Light shines on the protuberances. 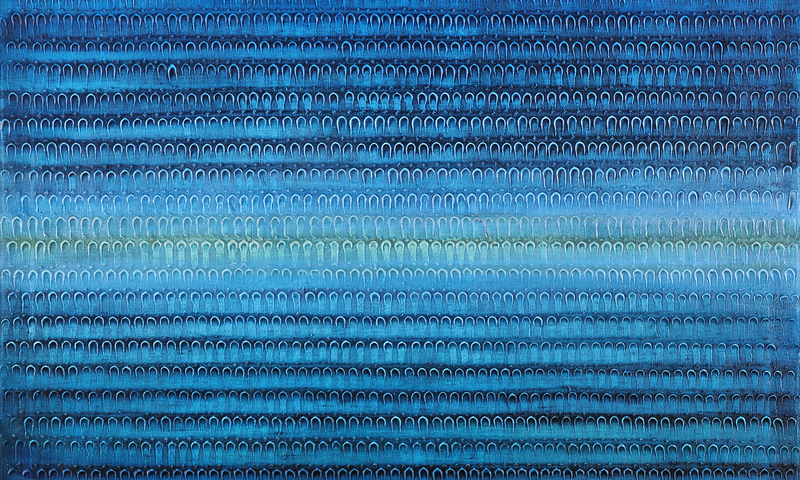 The works, in which blue, green, or penumbra were the dominant features, can be seen as representing a forest, a memory of the sea or a sunny beach, or as a nonrepresentational painting of the atmosphere of the individual parts of Vivaldi’s “Four Seasons”, or anything else that the viewer’s imagination might suggest. This is perhaps what the richness of contemporary art, and also Leszek Nowosielski’s achievements consist in." "Two French medals for Polish artists. In Paris, the gold medal for ceramic compositions went to a well-known Warsaw artist, Leszek Nowosielski, who exhibited his works not long ago at the spring salon in Grand Palais. His wife, Hanna Modrzewska-Nowosielska, received a bronze medal at the same exhibition." "Like no one else, Leszek Nowosielski can represent the charm of a medieval chivalric epic, revive the visions of tournaments, fights, and struggles." "Leszek Nowosielski is one of very few artists who referred to the historical subject matter in contemporary plastic arts. His impressive frieze representing the times of the Piasts with armed warriors fighting invaders, won him an honourable prize (gold medal), and was bought to decorate a wall in the Juvisy Paris-Sud mayor’s office." "Historical subjects are extremely rarely found in today’s art. Leszek Nowosielski is one of the exceptions: history and militaria are objects of his abiding interest, which is expressed in plastic techniques." "Nowosielski’s art is connected with the French tradition in its surprising precision in the treatment of details, which creates a unique, stylised, seemingly naturalistic picture. The artist was also fascinated by the culture of former times: from the Assyrian art he took the hieratic model of the frieze, and he looked for thematic inspirations in Ancient Greece. All these diverse influences made up an undoubtedly original whole."